When you get pregnant, one of your main concerns may be about how much weight you should gain during your pregnancy so that you can more easily lose it after you give birth. It is important that you gain some weight during your pregnancy since the baby MUST have enough nutrients to develop normally. Just remember that being pregnant does NOT mean you can eat twice as much! Your healthcare provider will help you determine how much you should gain during your pregnancy to maintain your health and the health of your newborn. What is a healthy weight gain during pregnancy? The answer to this question is: it depends. Your healthcare provider will be the person who can give you the best advice on diet and what your weight gain should be during your pregnancy. Some factors to consider are your weight before pregnancy, your general health and body type, and how many babies you are expecting. Shoud You Worry When You Are Overweight or Underweight? Research shows that women who start a pregnancy being overweight should gain some weight; however, it is important that the weight gain be closely monitored. Women who are overweight have a higher incidence of high blood pressure and diabetes and both of these conditions can be a problem for both the mother and infant during and after pregnancy. If you are underweight when you get pregnant, your healthcare provider will monitor your weight gain to ensure that you are gaining enough to support a healthy pregnancy. Many women with a low BMI go on to have healthy pregnancies and babies. 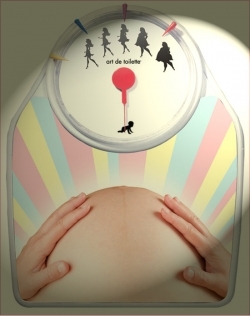 However, if you are underweight, the odds are higher of having an early delivery and a smaller than normal baby. You can simple click our pregnancy weight calculator to dertermine how much weight gain is healthy for you. Where Do the Extra Pounds Go During Pregnancy? When you get pregnant, be sure to make an appointment with your healthcare provider. The earlier you get in during your pregnancy the better – especially if you are starting the pregnancy either over- or underweight. If your doctor or midwife determines that diet may be an issue for you, you may be referred to a nutritionist who will help you to develop an eating plan that is healthy for you. In general, your healthcare provider or nutritionist will want you to be on a well-rounded healthy diet. You may need to take in more calories during your pregnancy but it is critical that these extra calories be nutritious ones and NOT the empty calories of junk food. Normal weight women should eat about 2000 calories each day – and that will usually be enough during the first 5-6 months of your pregnancy. During the last trimester as the baby begins to grow faster, you will find that you will need 200-300 calories extra each day. Make smart choices in your diet substituting fruit, vegetables, and lean meat for fast food and sugary desserts. During your pregnancy, you will feel better if you eat six small meals each day rather than three larger ones. Be sure to eat shortly after you get up in the morning – and start the day with some healthy protein like peanut butter. During your last trimester, your extra calories should be in fruits, nuts and vegetables. Fruit juices high in vitamin C will be important. Milk and other dairy products are important during pregnancy and low-fat versions are perfect if you are overweight or obese. Along with diet, be sure to get some exercise every day. This will ensure that the calories you eat are converted to muscle rather than fat. You will also be able to lose pregnancy weight quicker after delivery if you keep exercising. Be sure to check with your healthcare provider about any questions you have about appropriate exercise during pregnancy.